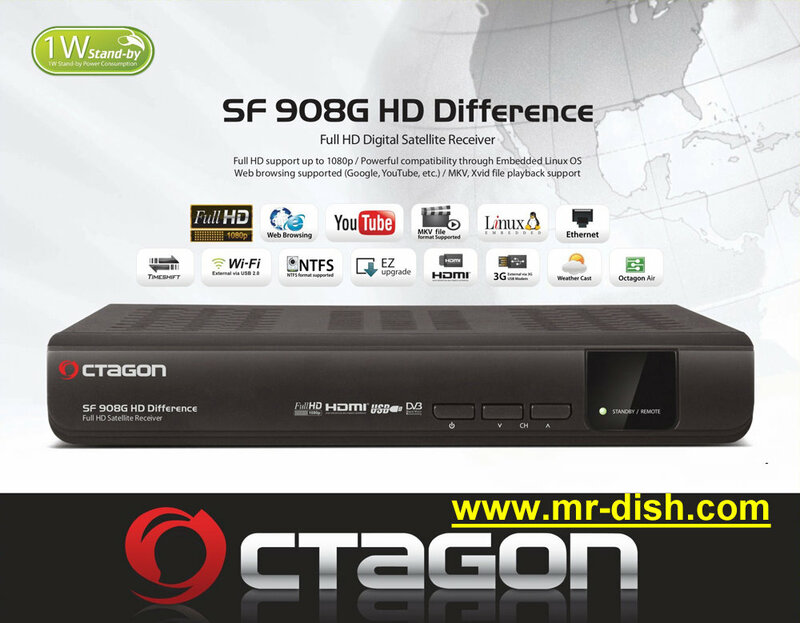 The salient feature of the new OCTAGON SF908G HD satellite receiver is its dimensions. The device is only 22cm x 3.5cm X 14.5cm small. 450MHz processor, with a total of 512MB memory you are well equipped for the future. The small one with the big achievement is functionally in no way inferior to his big brothers. With the Octagon SF908G DVB-S2 Full HD viewers can fully exploit the variety of multimedia options such as Youtube, Web Browser (FreeTV + add-ons), Internet TV + (IPTV), Internet Radio + (web radio) and more. Digital television and even HDTV, whether freely receivable or encrypted, can be recorded with the multimedia expert on the hard drives (USB & LAN), clearly arranged and time-shifted. The modern Full HD tuner can watch an HD TV program and simultaneously record a program. Connection to external devices is child’s play thanks to numerous ports, allowing you to play MP3 files, photos, videos and much more.